Geological time is on a different scale from human time. The earth is estimated to be 4.6 billion years old and life is thought to have become dominant on Earth 542 million years ago. While time is often measured in hours and minutes, to geologists, time relating to rocks is measured in 100s and 1000s of years. 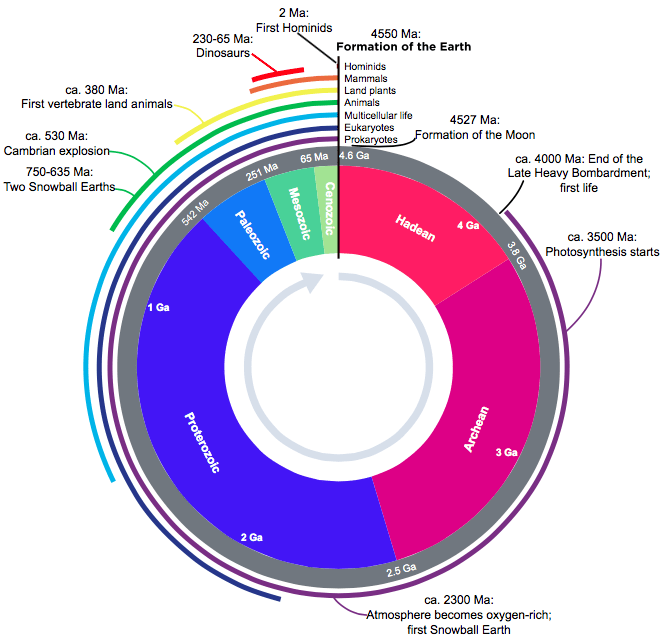 This time is divided into eras and periods which is the formation of the geological timescale (see diagram below) which relates to events, such as mountain building, atmospheric changes or widespread sea level change, that have happened in the Earth’s history. For example, tropical weather in the UK formed coal and limestone which is known as the Carboniferous Period. The most recent period is known as the Quaternary period in which the Ice Age occurred. Granite is from the Permian Period. It is a hard, igneous rock, made up of quartz, feldspar and mica. Carboniferous Limestone is from the Carboniferous period. It is a sedimentary rock made of calcium carbonate. It reacts with the acids in rainwater and dissolves to form distinctive scenery such as limestone pavement, caves and gorges. Chalk is from the Cretaceous period. It is also a sedimentary rock made of calcium carbonate. It is porous, so water can penetrate it. It is eroded by solution. Clay is from the Jurassic, Cretaceous and Tertiary periods. It is a sedimentary rock made of tiny particles of weathered rocks and minerals. What is the pattern of rock distribution in the UK?